According to a growing chorus of leading integrative medical doctors, Linda Freud possesses what may be the most unique ability to heal or dramatically improve chronic health conditions in the world. The reason for this, Linda claims, is because its origins are from beyond this world. What is a medical intuitive? Like a forensic psychic brought in to solve a crime, a medical intuitive is a medical psychic detective, brought in to find the hidden causes of chronic medical conditions that have eluded conventional doctors and diagnostic lab tests. As she works with a pendulum while scanning complex databases of medical, emotional, and metaphysical information, Linda channels angels and spirits to receive incredibly accurate information on chronic heath conditions. She then targets the appropriate natural remedies, detoxification and therapeutic protocols, as well as a channeled customized diet needed for successful treatment. 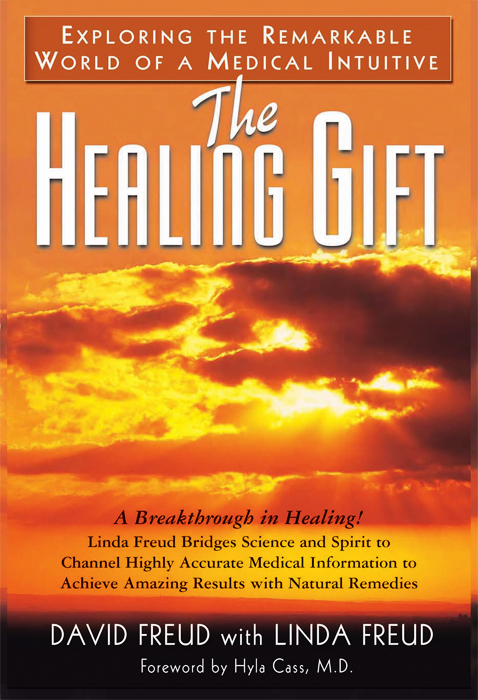 In The Healing Gift, author and medical researcher David Freud leads the reader down the scientific path of verification of Linda’s diagnostic and treatment protocols through powerful testimonials of healing that defy conventional logic. Instead of relying on diagnostic lab tests, she uses a process entitled Metaphysical Systems Engineering™, through which she receives detailed information on challenging medical conditions. There are stunning testimonials from her clients describing difficult health conditions she has successfully treated. These include arthritis, chronic fatigue syndrome, herpes, ulcerative colitis and infertility, where the common underlying theme is undiagnosed environmental toxicity. 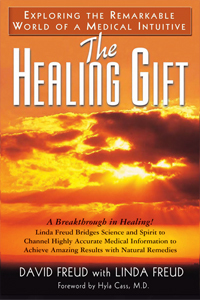 “David Freud makes a compelling case as he demonstrates that his wife Linda’s ability to channel incredibly accurate medical information often results in extraordinary healing. This may be the long awaited breakthrough in consciousness so urgently needed in a world gone mad. What emerges is a unique integration of science, holistic medicine, and ancient spiritual knowledge involving angels and Kabbalah into a new unified approach for healing chronic disease and optimizing wellness. As her dramatic case histories presented here show, Linda Freud is far beyond the level of any medical intuitive that I am aware of. I highly recommend The Healing Gift as a paradigm breakthrough in holistic healing.” – Gabriel Cousens, M.D., Director of The Tree of Life Rejuvenation Center, and author of There is a Cure for Diabetes and Conscious Eating. The second half of the book introduces Sigmund Freud, Linda’s main spirit guide with another revelation — Sigmund is now working through Linda to reinvent the field of psychology with discoveries he has made in the spirit world since he transitioned in 1939. From a physiological perspective, this includes the use of natural remedies to ease emotional suffering brought on by depression, anxiety, and hormonal imbalances. The crown jewel of the book, however, is a remarkable channeled conversation on reincarnation with Sigmund Freud and later Carl Jung, as well as discourses on Linda’s communication with angels, the distressed state of the world, and more surprising revelations. As it ushers in a new age of miracles and hope, The Healing Gift is designed to shake things up as it offers new breakthrough perspectives on healing and spirituality. It is guaranteed to provoke enormous controversy as it provides unique and overwhelming evidence that an authentic bridge exists between science and spirit.